$1.69 & FREE Shipping on orders over $59. Flare Fittings are the ideal way to connect draft tubing to Ball Lock or Pin Lock quick disconnects, because they can be easily and non-destructively disassmbled for cleaning. 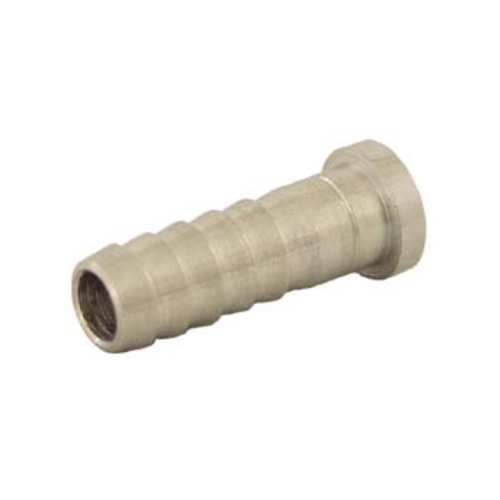 This 1/4" Barb Flare Fitting is used with a KEG600 or KEG601 Swivel Nut to attach to a Beverage Out keg quick disconnect. This allows you to disconnect your beverage line from the QD for cleaning without having to cut the tubing off of the barb. Made from AISI304 stainless steel. Necessary for the install of the couplers I'm using. purchased the wrong size barb for my 3/16 hoses. I need 1/4 for 3/16. I swear, I have 45 to 50 of the 5/8" size. Have you ever tried to force a 5/8" barb in a 3/8" beer line? I actually thought "Hey, why not shove a metal chopstick in the beer line in order to stretch it a bit". Now I have a metal chopstick permanently encased in cheap beer line. Do these fit to 3/16 inch tubing? BEST ANSWER: Yes, if you dip the end of the tubing into boiling water to soften it, it will be a snug fit and you won't need clamps. Attach the barb to a QD with the flare nut first, then you'll have something to push against when you push the tubing on. Works great. If you dip the end of the tubing in hot water to soften it, yes, it can be done. Yes, I just run my tubing under hot water and it will go on. Do I need 1/4" flare fitting and 1/4" swivel nut to attach this to 5mm ID tubing? BEST ANSWER: Yes. The nut tightens the barb to the disconnect. I have these on all of my connections so I can take the disconnect off the beer line for easy cleaning. Yes. The flare fitting will go into tubing with swivel nut. Place swivel nut on tube first. Then you can attach by screwing into the ball lock. Perfect fit for the beer line. Easy to install. Great quality. Beside the fact I cannot use it right now, it seems to be a high quality piece of ss barb. No leaks. Simple to use. I have a few of these in my draft system as liquid lines. No complaints and easy to remove the accompanying nut for line cleaning.